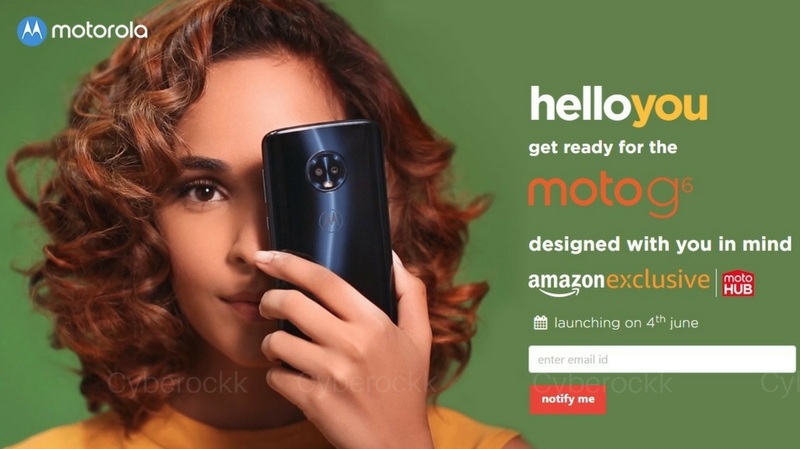 After several teasing and speculation about the launch of the Moto G6 and Noto G6 Play, Motorola today finally announced that it will be launching its newest generation ‘G’ series smartphones the Moto G6 and Moto G6 Play in India on June 4. The Moto G6 will be an Amazon exclusive while the Moto G6 Play will go on sale exclusively on Flipkart. Both the devices will also be available for purchase through various Moto Hubs in India. The Moto G6 comes with a 5.7-inch Full HD+ display with an 18:9 aspect ratio. The phone runs on the Qualcomm Snapdragon 450 platform, same as the newly launched Samsung Galaxy A6+ and Galaxy J8. The Moto G6 is available globally in two variants – 3GB RAM/32GB storage and 4GB RAM/64GB ROM. For its photography skills, the G6 features a dual-rear camera setup with 12MP+5MP cameras and an f/1.8 aperture lens at the back. At the front is an 8MP camera. The device is equipped with a 3000mAh battery and it comes with TurboPower charger for fast charging your phone. It features p2i-rated water-repellent coating which protects it from splashes and light rain. Now talking about the Moto G6 Play, the device comes with a 5.7-inch HD+ display with an 18:9 aspect ratio. It is powered by the Snapdragon 427 SoC and is available in two variants – 2GB RAM/16GB storage and 3GB RAM/32GB ROM. The Moto G6 Play features a single 13MP camera with PDAF and f/2.0 aperture lens at the back, while at the front it houses a 5MP lens. The smartphone is equipped with a 4000mAh battery with a 10W fast charger. Just like the G6, the G6 Play also features p2i-rated water-repellent coating protects it from splashes and light rain. Meanwhile, customers waiting to by the new Moto G6 and the Moto G6 Play can register here to get notified when the stock arrives.